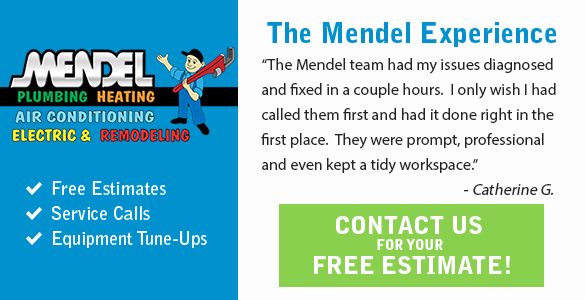 Mendel Plumbing & Heating has one of the largest teams of technicians in the St. Charles, IL and Fox Valley area. That means same day service is our norm. We’re ready when you are. You’ll always receive responsive service from trained AC technicians at Mendel. Contact us today to learn more and to get started - 630-377-3608. Summers in the Fox Valley region in Illinois are known for heat and humidity. Keeping your home comfortable requires a reliable air-conditioning unit. When yours is not providing reliable service, the team at Mendel Plumbing & Heating is ready to provide comprehensive air-conditioning repair and installation. Since 1985, we have been the name homeowners in St. Charles trust for comprehensive HVAC repair services. We also service surrounding communities of Geneva, Batavia, North Aurora, South Elgin, and more! Sometimes, you will struggle with one or all of the above. Each of these can be difficult to find without the right training, which is why you need the services of Mendel's qualified and certified team. Give us a call today - 630-377-3608. Mendel backs every job with a one-year warranty on both parts and labor. Residential customers can get a three-year parts and labor warranty if they are a member of our MendelCare VIP Protection Plans. Give us a call at 630-377-3608 for a service call, equipment tune up, or free estimate from our certified professionals.